I love pizza. Next to noodles I think it’s one of the most versatile foods around. I adore how personal a food it can be and the way it manages to vary so much from place to place. People get so passionate about it. I’ve heard all the following: pineapple is treason, anchovies are vile, an egg?-disgusting, it must be white flour (or kamut or spelt…. 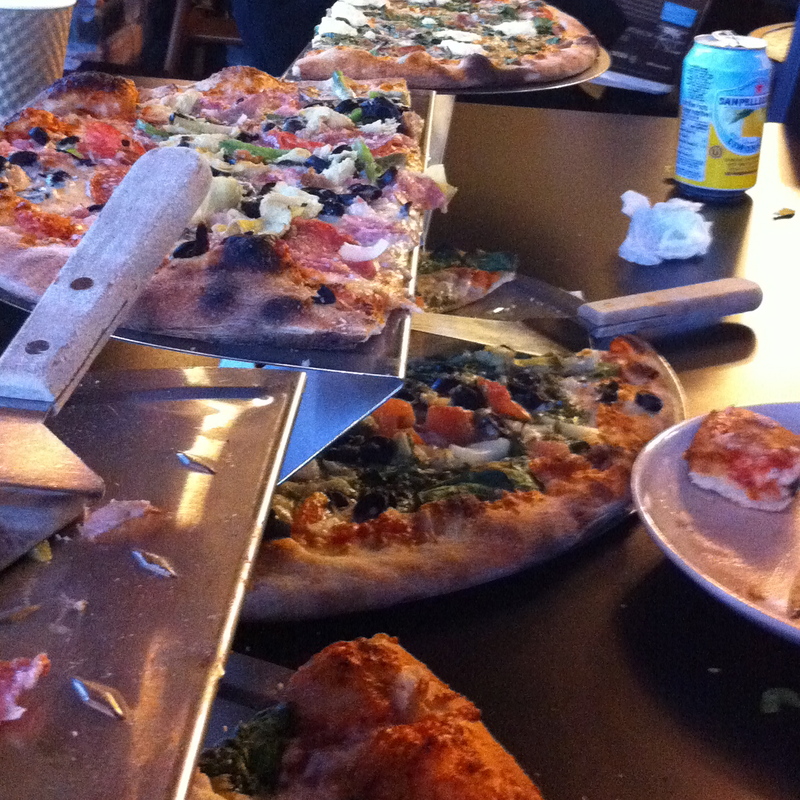 ), it must be thick (or thin) crust, all meat, no meat. Strong feelings abound on the topic. From your basic late night slightly inebriated too much (cheap) cheese pizza all the way to your fancypants thin crust artisanal one with toppings shipped from far off magical lands, most of the time, pizza is just pizza. I’ll eat it all. Growing up pizza was often the birthday party food of choice and in college my roommate and I would stay in on Friday nights, order pizza and watch Dolly (I never said I was cool…). In my humble opinion I believe pizza is good for quiet nights in, rowdy nights out, leftover for breakfast (although I hate cold pizza, I think it’s a travesty) and elaborate bring your own ingredient multi hour extravaganzas with friends. It can dry your sad tears or reduce you to happy tears. Only once have I raised my eyebrows in confusion and hesitated. Sitting with friends in a small country restaurant in Italy listed on the menu was Pizza Americain. 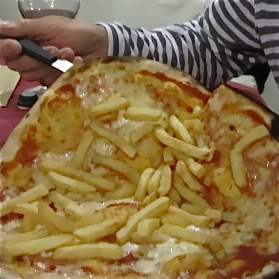 Pizza with french fries. After a chuckle (and a grimace) we moved on and ordered. A glass of wine, or two, later the waitress arrived at our table proceeded by the most tantalizing scents. Knowing how it is imperative that I always get to try what everyone else is having (I wouldn’t want to miss out after all) I thought nothing of it when, with a glint in his eye, my friend said “want a piece?”. I looked. There it was. The American Pizza. May the purists of the food world forgive me (and my fitness coach never read this) but I ate it. There are no words. It was awesome. I will most likely never eat it again. But in that one moment on a holiday summer night, it was the most heavenly blend of cheese, tomato, salt, and potato I had ever tasted. All of my favourite food groups on one plate. 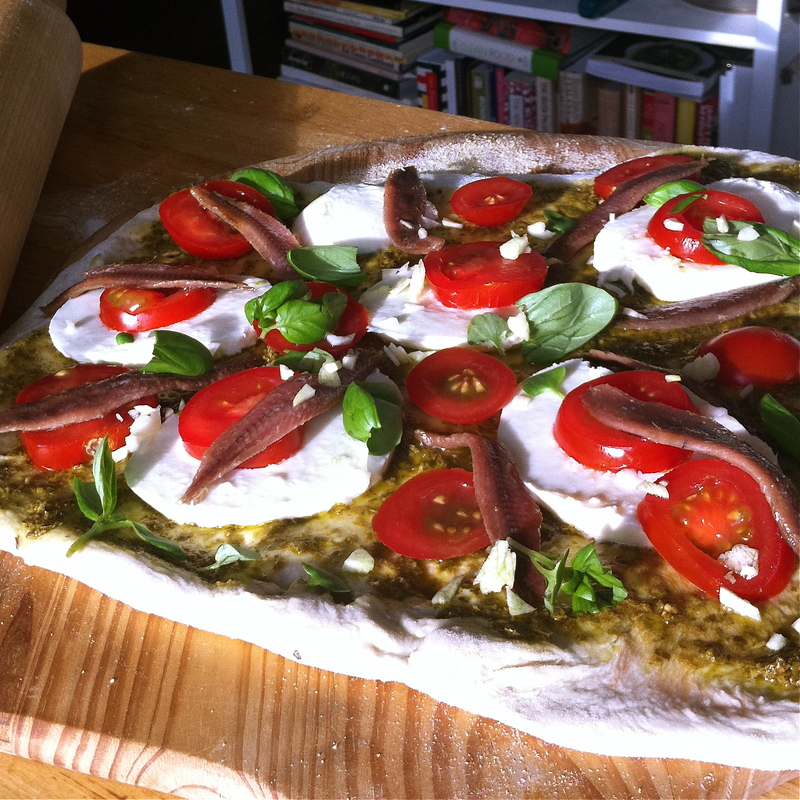 It confuses me that so many people think of pizza as too challenging to prepare. I’m making the assumption that most of you, like myself, do not have access to an extra super duper hot pizza oven. Maybe in my next life. However, I’m also assuming that most have an oven that goes up to at least 400 degrees. So again I ask – why is it so hard? You can put pretty much anything on top of it, and with a tiny bit of experimentation you can use almost anything as the “crust”. No. Don’t scoff. I’ve even had a cauliflower based pizza crust before. And, while it was a bit like pretending spagetti squash is spagetti, it was really, really good. But that’s not why I’m here. Pizza dough is the foundation of the basic pie. Using store bought dough is to me like eating spaghetti with your fingers. It can be done, but it’s probably best not to. 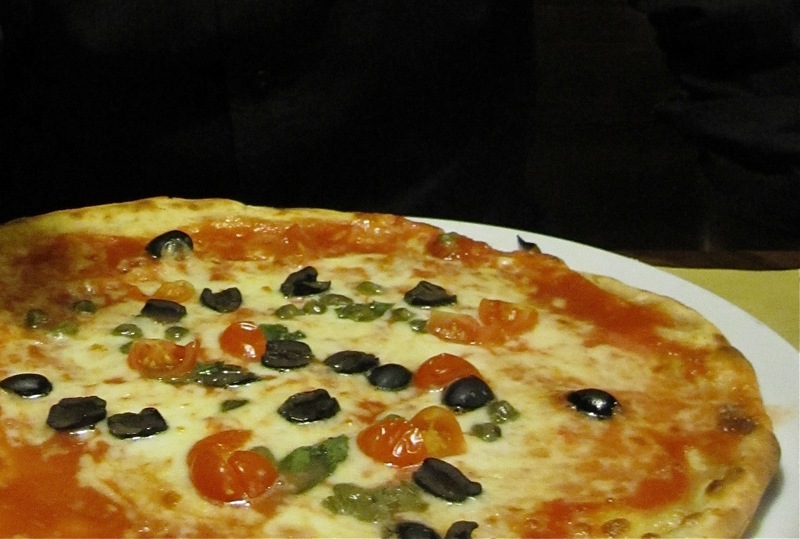 Pizza dough is incredibly simple to prepare. It can be made an hour before dinner or become a day long production. Make it with your spouse, friends or kids and turn it into a family affair. This is my standard variation. I recommend making a double batch, throw some in the freezer for future meals and enjoy the rest. Different flour combinations will, obviously, produce different textures and lightness of crust. This combination is my current favourite. Toppings are up to you. My only rules? Use good quality ingredients and keep it simple. Basic dough recipe for two pies. Mix flours and any spices into a bowl. Make a small well in the centre of the flour. When yeast has risen add to flour mixture. Add remaining water and the oil. Lightly flour your hands and the counter and shape dough into a ball. Knead dough for 5-10 minutes. It should be smooth and elastic. Place the round ball of dough in a lightly oiled bowl, cover with a tea towel and place in a warm place for about an hour. When dough has risen, divide it into two, then shape/roll it into desired pizza shape based on the size of your pan or stone. If using a pizza board to transfer onto stone, sprinkle it with cornmeal first to allow for easy transfer. Build your pizza, place on stone/pan and place in the oven (I like mine at 400 degrees). 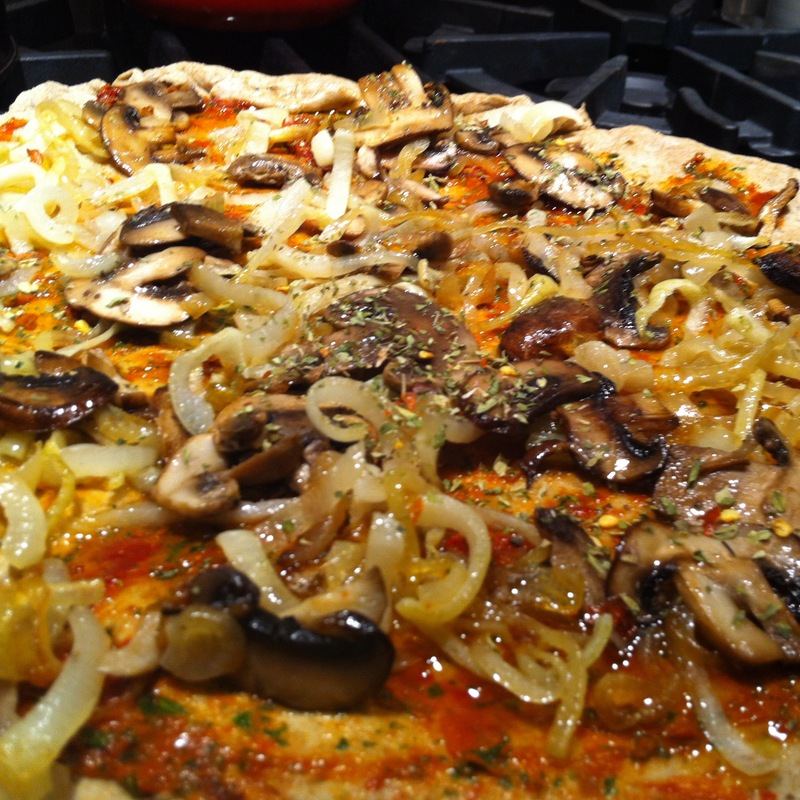 Cook 10-20 minutes depending on oven temperature and toppings. 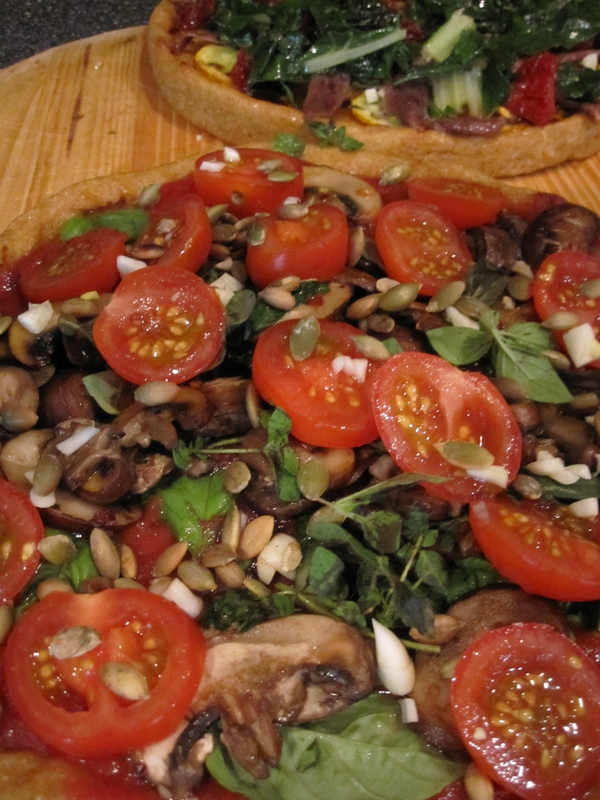 This entry was posted in Cooking, Cooking techinques, Friends, Herbs, Pizza, Recipe, Vegetarian and tagged basil, flour, freezer, french fries, garlic, herbs, olive oil, Pizza by mostlynoodles. Bookmark the permalink. I know what I am making for dinner this weekend. YUM!